I am James Maliakal, writer of this blog and is with Pioneer Scientific. I have 12 plus years of experience working in the research lab in academic and leading life science companies. From my years of experience, I have designed and developed unique products which made my work a little easier and efficient in the lab. I have authored and published in peer reviewed journals. Pioneer Scientific is a leading manufacturer and distributor of innovative products, high quality laboratory instruments, and research tools. Contact me to know more. Human stem cells are widely used for research and therapeutic development in recent years. Effective stem cell therapy to alleviate serious disease conditions will be a reality in the near future. Although this field is steadily gaining ground for research publications and funding, there are still significant obstacles to overcome for this to become reality in every day life. Pluripotent stem cells maintained at their dedifferentiated state has the potential to develop into three cell types- endoderm, mesoderm, or ectoderm and to cell types derived from there, such as blood, muscle, and neurons. Developing targeted therapies using stem cells to treat disease, repair or regenerate tissue and organs is at the heart of the stem cell therapy. This can be accomplished, as individualized therapy customized for the patient is the basis for personalized medicine. The source of stem cells for this can be from embryonic stem cells (ESC) or derived from genetically reprogrammed adult cells to become induced pluripotent stem cells (iPSC). Various factors determine the therapeutic development and options for which types of cells are used for specific situations. These include purity, cost effective manufacturing utilizing fully tested reagents and media for consistent production, safety, and ease of production. These factors will determine the advancement of therapeutic value of stem cells to cure diseases and improve the quality of life for the patient. Pluripotent stem cells with the treatment of growth factor cocktails can produce a targeted population of cells of interest for transplantation, genetic manipulation, delivering therapeutic agent, or regeneration of an organ. Stem cell lines are valuable tool to screen drug compounds, understanding mechanism of action of a particular drug, cell based assay models to study biological effect, and preclinical toxicology studies. There are several companies offer newest technologies and products to grow and differentiate stem cells successfully. These include offerings of growth factor and other hormone cocktails, extracellular matrix coated cell culture vessels to grow the cells, and multiwell plates with grid bottom or petridish with numbered grid to identify and study stem cell colonies in vitro. At the Stem Cell and Regenerative Medicine center at University of Wisconsin, Madison, a group converting pluripotent stem cells to beating cardiomyocytes. In the future these differentiated cardiomyocytes will be useful to repair cardiac muscle damaged due to ischemia, cardio myopathies or other cardio vascular diseases. The leading scientists have put forwarded the idea of engineering the adult skin cells or blood cells to become pluripotent cells, expand them and freeze them for future needs. As the need arises, expand the cells in vitro, differentiate them by treating with right combination of growth factors and hormones, and make them to relevant cell types to repair the heart. With the availability of new tools research in this field is rapidly advancing. It was shown that by carefully culturing the induced pluripotent cells (iPSC) as 3 dimensional models could grow functional human myocardium. One of the challenges in developing stem cells into therapy is the scalability. The technology has advanced significantly and growing millions and billions of iPSC cells are now possible with the right cell culture ware, and growth factors. Differentiating iPSC to specific cell type of interest is much more challenging. And growing large numbers of fully differentiated functional target population of cells such as cardiomyocytes still need to be developed. One of the problems is the ability to grow these cells in a fully defined medium ie, medium with out any animal products. Other challenge is to perfecting the right mixture of the extracellular matrix (ECM) to support the true differentiation of the cells. Selection and optimization of ECM is very important because they provide the right microenvironment, a reservoir for growth factors and a scaffold for the differentiation of iPSC to target population of cells. Stem cells grow as colonies in culture dish with or without treatment. Grid Plates ( 6 well culture plate with grid bottom, and 12 well plate with grid bottom) are new tools available for measuring and counting stem cell colonies. 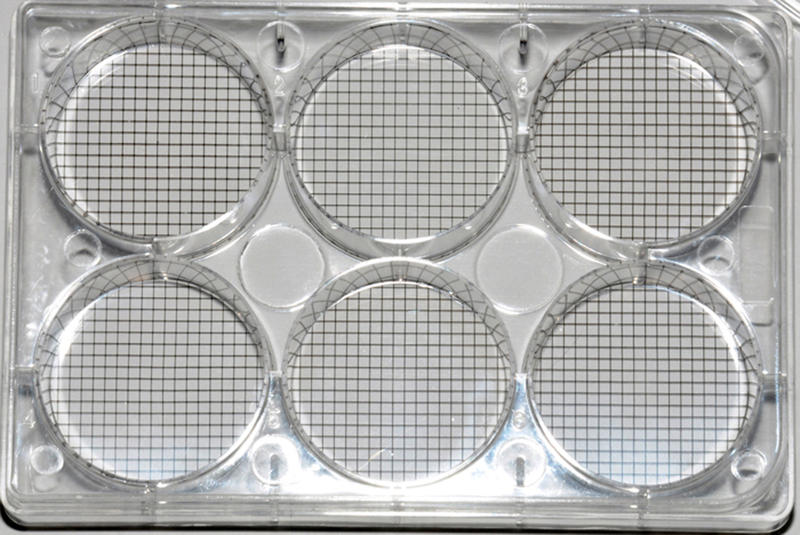 Cell culture dish with numbered grid is also a useful tool in identifying and counting stem cell colonies for research applications. Growing iPSC cells and differentiation them into targeted cell types such as neurons or cardiomyocytes requires special skill sets. As the technology matures it is important to have specially trained technicians and health care workers including doctors trained in these procedure so they can successfully treat their patients with established procedure. The regulatory agencies such as FDA need to be educated on the latest development so they can carefully guide the approval process of stem cell therapy with proper guidelines. With the multifaceted approach including improvement in technology, proper training, and regulatory framework, we will overcome the challenge and stem cell therapy will become reality. Freezing any type of cells for storage for future use is a very important need for clinical labs as well as research labs. At clinical setting at a hospital, patient samples of cancer cells of various types need to be stored for future need or research. Analyzing these calls provide vital clues about the cancer and potentially identify the right course of treatment. These cell samples are also useful for research in understanding the mechanism of action of the particular cancer. It is better to freeze cells when they are in the growth phase or when cells are growing rapidly. You can plate the adherent cells in a petridish or in T 75 flask and add fresh medium the day before you freeze the cells. Cells should be close to confluent ,covering most of the surface . At this stage they are growing rapidly and with fresh supply of medium, they are happy and healthy. If you are freezing suspension cells make sure they are also in the growth phase before you freeze them. Trypsinize the cells if needed and centrifuge them to a pellet. Remove the medium or PBS and re-suspend the cells in DMEM with 20% fetal calf serum. When you re-suspend the cells, gently pipette up and down without agitating the cells too much. The goal is to break up and cell clumps and make it into a single cell suspension as much as possible. Re-suspend the cells in half the volume you want. I usually count the cells using a hemocytometer to get total cell number. Usually the cells are divided so that each vial will have 1 million cells. If you need to freeze more cells or less than 1 million / vial, it is up to you. Mix the cell suspension in half the desired final volume. Keep the cells on ice. Next make up DMEM containing 20 % fetal calf serum and 20% DMSO. Gently add this to the cell suspension still kept on ice. Add slowly not to agitate the cells too much. Adding DMSO to the mixture causes an exothermic (heat generating) reaction, which can be harmful to the cells. It is important the cell suspension is kept cool on ice while adding DMSO mixture. The final cell suspension will be in DMEM containing 20% fetal calf serum, and 10 % DMSO. Keep the cells on ice for 30mins. Label 2ml cryovials (freezing vials) with the details such as cell type, number, medium and passage number if the cells are primary. Keep this labeled cryovials in a chilled cryovial cool chamber or cryovial cool block placed on ice. These are specially made solid metal tube rack with a notch machined at the bottom of the tube hole. This is a very useful feature, which will allow you to add cells into the vials with one hand while opening and closing the vials cap with the other hand. Unscrew the cap of cryovial with one hand while on the other hand hold a pipette, gently mix the cell suspension and pick up the cell suspension in the pipette. Because of the notch on the bottom of tube hole, when rotating the tube to un screw, the vial will stop rotating . In order for this to work you need cryovials with notch on the bottom. These are available from major manufacturers. Aliquot 1 ml of cell suspension into each cryovials. Screw the cap back on tightly with one hand. This can be done with the cryovial cool block. Put the vials in a labeled box and keep it in the -700C freezer overnight for the slow cooling. Next day put the box in the liquid nitrogen tank. Freezing cells is very commonly done for various reasons. Freeing away large numbers of cells in aliquots for future use. Genetically engineered clones or high protein expression cells for future expansion. Or primary cells with specific characteristics at low passage number to be used for future needs. We used to freeze human primary endothelial cells with good response to VEGF growth factor for migration assays. Depend where the source is, these cells respond differently to VEGF. Once we isolate a large pool of cells with good response to VEGF we freeze them for future needs. Here are some tips for freezing cells more efficiently, faster and to increase viability when thawed. It is better to freeze cells when they are in the growth phase or when cells are growing rapidly. You can plate the adherent cells in a petridish or in T 75 flask and add fresh medium the day before you freeze the cells. Cells should be close to confluent, covering most of the surface. At this stage they are growing rapidly and with fresh supply of medium, they are happy and healthy. If you are freezing suspension cells make sure they are also in the growth phase before you freeze them. Label 2ml cryovials (freezing vials) with the details such as cell type, number, medium and passage number if the cells are primary. Keep this labeled cryovials in a chilled cryovial cool chamber or cryovial cool stand (MCCVL)placed on ice. These are specially made solid metal tube rack with a notch machined at the bottom of the tube hole. This will allow operating the tube with single hand, while the other hand is holding the pipette with cells. This makes the process easier and efficient and saves time during the critical period when the cells are in contact with the exothermic DMSO cell culture mixture. Unscrew the cap of cryovial with one hand while on the other hand hold a pipette, gently mix the cell suspension and pick up the cell suspension in the pipette. Because of the notch on the bottom of tube hole, when rotating the tube to unscrew, the vial will stop rotating. In order for this to work you need cryovials with notch on the bottom. These are available from major manufacturers. Aliquot 1 ml of cell suspension into each cryovials. Screw the cap back on tightly with one hand. This can be done with the cryovial cool block. Put the vials in a labeled box and keep it in the -700C freezer overnight for the slow cooling. Next day put the box in the liquid nitrogen tank. PCR has become a widely used tool in basic research as well as clinical diagnostics of a variety of infectious diseases. As the sample type gets complex, the technique also becomes complex, including sample prep for PCR. For the complex specimens, careful preparation of the samples is critical to achieve best results. How the samples are handled, how it is protected from degradation etc. For complex and sensitive samples any element of PCR, no matter how simple can affect the results with serous consequences, and costly waste of samples and reagents. I designed the PCR cooling chamber ( PCR tube rack originally for my own personal need after going through laborious PCR sample prep steps. Here is how. During this time new PCR format started to emerge in the market. These were 96 well PCR plates, where you can do 96 samples at once. In order to accommodate the 96 well PCR plate I asked the machine shop to make a larger block with wells corresponding to the tubes. Since some of the reagents for the PCR prep came in 0.5 ml tubes and 2 ml tubes, which needed to be kept cold, made the PCR blocks with additional space to hold the tubes as well as a 96 well tray. After precision machining the PCR Block, the aluminum blocks are anodized to protect the surface from corrosion. Afterwards I made these and gave it to my colleagues to use. At this point I realized that if this item is useful for me, PCR Coo Block might benefit other researchers. I made this into a product and in the last ten plus years, it is very widely received in the market. After few years, I designed the Double PCR Cooling Block, which can accommodate two 96 well PCR tray and reaction tubes on the same block. It is very useful to process two plates or transfer samples from one plate to other. PCR cool block (PCR Cool chamber) also provide a stable platform to prepare large number of samples without worrying about keeping them straight, or floating in ice water when the ice melt. If you prepare 96 well PCR plates , tube strips or individual tubes, this is a very useful product. Tissue culture dish are some of the common item used in the cell culture. Depending on the application there are a number of sizes and shapes of tissue culture dish are available to use. Some come with tissue culture treatment for growing mammalian cells. Other type come with no coating and is used for bacterial culture. Some type comes with agarose already added. Tissue culture dis are also available in glass or plastic. Tissue culture dish are also used in stem cell culture. One can plate stem cells in these dishes and watch them grow. After few days the individual cells form colony of cells. It is important to keep track of these colonies the size and location for future reference. For this purpose a new type of culture dish is available- Cell Culture Dish with Numbered Grid. (Grid Petri Dish). These are 100 mm diameter cell culture treated dish with lids. These dishes have a 10 mm square grid pattern printed on the bottom outside of the dish. Not only there are printed grid pattern, it is also numbered. This is a very useful feature to keep track of cells or cell colonies during and after an experiment. Especially when the dish are removed from the incubator frequently for treatment. The type of tissue culture dish plays an important role in a cell’s recovery and hence its applications. Recovery of cells cultured in TCPS dish and thermoresponsive TCPS dish vary significantly on the basis of the retention of structure and changes to ECM. Tissue culture is a process of studying the biological nature of cells and their properties in a proper environment, which facilitates further controlled experiments to manipulate and analyze it. Tissue culture analysis and research are highly significant for the development of vaccines, cancer research, and a variety of other applications. While studying biological systems, various aspects of the system are taken into consideration. Researchers mimic the physiological conditions by methodically controlling certain aspects of an in vitro culture such as solution pH, oxygen tension, the number of cells per volume of liquid media, culture media, nutrient composition, and frequency of media exchange. It has been observed over the years with following established cell culture protocols that each individual feature can influence cell behavior significantly, even the source of Tissue Culture Polystyrene (TCPS) plays a key role in the observations of cell culture and its repeatability. A significant development in cell culture dish preparation and the treatment of the TCPS dish leads to various alternative qualities giving rise to a significant change in the behavior of the cell culture. Cells grown on conventional TCPS dishes are required to be harvested by the enzymatic proteolysis of an extracellular matrix (ECM), such as trypsin and chelating Ca2+ ions to disrupt cell-cell junctions with substances such as EDTA. Thermoresponsive dish is created by treating the surface of the TCPS dish with a thermoresponsive polymer, poly (N-isopropylacrylamide) – PIPAAm. Cells grown on PIPAAm treated TCPS dishes on the other hand, can be recovered simply by lowering the temperature below lower critical solution temperature (LCST). The cell detachment process here is active, which is induced by intracellular events such as signalling and cytoskeleton reconstruction. The process of ‘Separation’ is natural for the surface of the thermoresponsive cell culture dish. A confluent cell sheet can be recovered by using this type of cell culture dish, which is grafted with the polymer layer of thermoresponsive nature and by taking care to maintain a dry thickness of 15 nm. Based on temperature trigger and controlling the derivatives thereof, and by using surface functionality and microfabrication, next generation thermoresponsive cell culture dish is developed. A significant difference here is that the cells recovered from conventional TCPS dishes, may have damaged cell membrane and ECM due to trypsin, whereas the cells recovered from thermoresponsive cell culture dish retain their functions and cellular structure. This makes the use of thermoresponsive cell culture dishes use in the recovery of cell proves to be a powerful tool for investigating the molecular machinery in the cell-surface detachment.Using thermoresponsive cell culture dishes, cell culture gets detached as a single cell sheet. This happens when the temperature is lowered below LCST as the PIPAAm treated TCPS surface becomes hydrophilic. Since no enzymatic proteolysis treatment is used for the separation, the membrane protein and ECM on the cell sheet are retained. The applications of thermoresponsive cell culture dish includes colony formation and stem cell colonies characterizations, growing of human cells, growing primary cells including endothelial cell, neuronal cell. Relocating cells and their clusters, culturing and studying of cancer cells and hematopoietic cells, prevention of anchorage-dependent cells from separating, Locating and recording of cells such as stem cells, colonies of tumor cells and hematopoietic cells etc. form the major applications where the thermoresponsive culture dish can make a significant difference.Different technologies such as 3-D cell culture, bio-assembler are being invented to tackle the vast research in this rapidly evolving field. When doing cell culture either it is for growing cells for cell based assay, protein expression or cell transfection, it is very common to freeze cell stock for future use. Freezing the cells the right way will determine the percentage of cell viability during thawing. Using the right technique and the right tools will ensure the cells are frozen properly and will have a high percentage cells recover and grow during the thawing process. Label 2ml cryovials (freezing vials) with the details such as cell type, number, medium and passage number if the cells are primary. Keep this labeled cryovials in a chilled cryovial cool chamber or cryovial cool rack (MCCV) placed on ice. These are specially made solid metal tube rack with a notch machined at the bottom of the tube hole. This will allow operating the tube with single hand, while the other hand is holding the pipette with cells. This makes the process easier and efficient and saves time during the critical period when the cells are in contact with the exothermic DMSO cell culture mixture. When working with large number of samples, whether it is protein assay, or DNA assay, it can be very difficult to keep track of samples in an orderly fashion. Especially if the samples are temperature sensitive, putting all these tubes on ice bucket can be challenging, not to mention keeping them straight so you can add or remove samples easily. Having sample tubes not organized can also lead to mistakes and increased variability, resulting in lost productivity, and wasted expense. When you work in a cell culture laboratory, protein chemistry laboratory, or molecular biology lab often you are required to do large assays. I have worked in few companies in the lab and I know what it is like to deal with dozens of sample tubes. Very confusing and often difficult to keep track of , which leads to costly mistakes. Hours of time spent on preparing samples, collecting samples all that can go to waste if you make a mistake mis- identifying the sample, or adding the wrong reagents. It is very frustrating, especially painful when your manager is waiting for the data to present at a management meeting. Sound familiar?. You are not alone. Now that I am no longer working in the lab on a daily basis, I had some time to think about some solutions to alleviate this problem. Although it is not perfect, the solution I have come up with are helpful to some degree, and avoid come costly mistakes during sample processing. One of the things I was frustrated when working with large number tubes is that, the samples had to be kept on ice to prevent degradation. When there are dozens of tubes which although are labeled, keeping them organized in an ice bucket was very challenging. The tubes rarely stay straight, many times they tip over, and if you let it sit these in a room temperature, the ice will melt and the tubes will float, and make it very difficult to work with. The second problem was with all these tubes it is difficult to see them easily if they are arranged them all at the same height. Two products I designed will help with this problem. One of them PSMC 90 is a large solid aluminum chamber, which can hold up to 90 x 2 ml tubes. Since the stand is made of metal it stays cold when placed on top of the ice in an ice bucket. Not only the tubes are organized perfectly in rows, since most of the tubes are surrounded by cold aluminum, all the sample tubes are uniformly kept cold, which may help get better CV for the assay. Another very useful tube holder is SSTH, multistep solid aluminiun displays tubes rows at different heights. This is specially useful if you are working with large number of tubes, which contain different items. One look and one can easily identify the tube you are looking for. Since it is made os solid aluminum, you can place it on ice bucket to cool the sample or on heat block to warm up the samples. 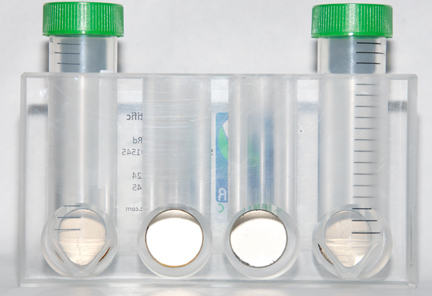 It is ideal if you are working with large number of tubes in the assay. The second item is ST15, or SR02 which is a stainless steel tube rack for holding 1.5 ml to 2 ml tubes. As the name suggest the tubes are placed at different levels or tiers. The biggest advantage for this arrangement is that, all the dozens of labeled tubes are easily visible with one look. No tube will be hidden behind another tube and difficult to see. It is like stadium seating for the tubes. These are simple innovations and tools to make the work flow to get a little easier, and make less mistake when doing large assays with dozens of sample tubes. During the last few years PCR technology is widely used in basic molecular biology research, molecular or clinical diagnostics, and personalized medicine. The days of using a handful of samples for PCR analysis are replaced by high throughput and ultra high throughput PCR analysis of patient’s clinical samples, or mechanism of action during the drug target validation. Samples can be processed in 96 well plates, 384 or 1536 well plates. As the number of sample size increases, so does the variation in sample processing and the results from the tests. If there is very high variation between triplicates of the same samples, the interpretation can be difficult, and may affect the outcome of the experiment or diagnostics. So keeping the variation between samples of the same type is very critical to have the confidence in the interpretation. Purifying DNA, RNA and protein molecules are at the heart of diagnostics and molecular biology companies. This involves moving or separating the target molecule such as DNA, RNA or protein efficiently from a complex mixture. Increasingly magnet based separation is employed for this purpose. Magnets allow movements. 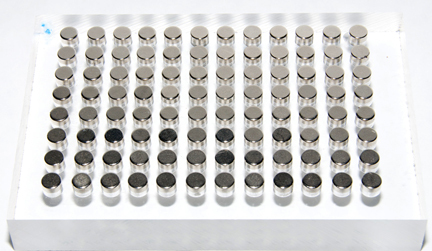 Large numbers of diagnostic companies have invested in the magnetic based separation technologies and have developed their own proprietary reagents for the magnetic separation platform. Companies such as Life Technologies, Promega, Takara Clontech are some of the companies offering magnetic particle based separation technology. In older technology, the magnetic particles was made of iron oxide, a soluble material that was protected through a thick polymer shell. As a result these particles were micrometer-sized particles. As the particle size increases, the binding capacity and efficiency of separation goes down. A newer technology of sub-100 nanometer sized particles is available on the market. One such product is Turbo Beads. They replaced the thick outer polymer shell with a very thin layer of grapheme. This thin layer of coating makes these magnetic particles sub-100 nm particles. Small particle size also provides increased surface area for molecules to bind, thereby increasing the extraction or purification capacity and efficiency. Older iron oxide based magnetic particles are a combination of iron, which is magnetic, and oxygen, which non-magnetic. Thereby the magnetic capacity of these particles is not as strong as pure magnetic particles. Some of the nano magnetic particles are made of pure magnetic particle, which makes their binding to the molecules very strong and lead to strong and efficient separation. Because of this strong binding capacity, they are reliable over hundreds of cycles, in harsh and demanding environments or very viscous complex media. The affinity of binding also depends on highest quality of linker attachment. Some of the best magnetic particles have very strong reliable chemical bond binding the DNA, RNA and protein molecules to the magnetic beads. The magnetic separation stands used to separate the molecules from the magnetic beads are equally important. You need well designed magnetic separation stands which with strong magnets to be able to bind the magnetic particles carrying DNA, RNA or protein for separation. This strong binding should also withstand harsh separation and washing buffers, and elution solutions and should be able to withstand multiple cycles, and perform very well. Pioneer Scientific magnetic stands offers magnetic stands with very strong magnets and perform very well. These include number options to accommodate varying volumes from small PCR tube volume to 50 ml tube volume. When considering the separation molecules based on magnetic beads, the quality of magnetic particles, and the magnetic separation stands are equally important. Biomarkers are a very powerful tool in clinical diagnostics for diseases, especially cancer. More and more sensitive biomarkers are identified and applied in diagnostic assays providing valuable information about the disease status and helping doctors to identify suitable therapeutic modalities. The research is carried out in two directions: (1) identifying more meaningful and relevant biomarkers for a specific disease and used in early detection. This is done at the basic research level at academic labs as well as at industry (2) equally important step taken by the industry in developing technology to detect even the smallest traces of the biomarkers in the patient samples. Both aspects are very important and necessary to make significant advancement in disease management and cure. Biomarker has a significant role in drug development as well. Biomarkers identifying specific disease phenotype are important for new drug development. Selective biomarkers can be used in parallel in drug development may reduce risk. A vast majority of drug candidates fail in final phases of the drug development cycle making the cost prohibitive. If there are very useful and relevant biomarkers applied during different phases of the drug development, the risk can be managed and reducing the overall cost of the drug development. A successful biomarker program will streamline the drug development pipeline and avoid less effective compounds in the pipeline. One of the less used but a powerful tool in the biomarker arsenal is imaging biomarkers or i-biomarkers. I-biomarkers are especially valuable in accessing the drug penetration to the target tissue, target engagement, and confirming the expected results. Imaging is very widely used in clinical diagnostics of cancer. However the use of imaging technology for drug development has been slow to adopt. It is partly because of high cost of setting up a well equipped imaging center as well as developing image-based biomarkers. Companies such as Imanova provide a highly integrated solution for molecular imaging. Imanova provides help in patient selection, i-biomarker for labeling, rigorous preclinical evaluation to reduce the failure risk. One another way to identify the engagement of the target is by cellular imaging of biomarkers from patient cells. This can be done by collecting the desired cells for evaluation, labeling for specific biomarkers, and imaging the changes to the cell population. In this area some of the very useful tools include modified cell culture products such as Multiwell Plates with Grids and Petridish with Grid pattern (Grid Plates), which allows for easy identification of cells, or colony of cells in the sample, and quantitate them. 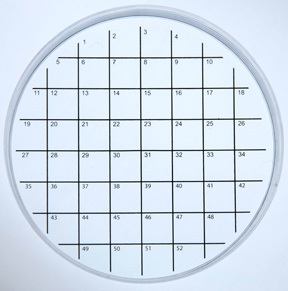 This easy to identify multiwell plates with grid and petridish with numbered grid are used in cell based assays, in cancer research as well as stem cell research. The grids allow for measuring positively stained cell number, cell location and colony size of the desired cells. Biomarkers are a very significant part of basic research and increasingly important tool in clinical drug development in the pharmaceutical industry. There new tools are being developed to accelerate the process and reduce the risk of costly failure of compounds in the late stage development. One of the problems in assays using 96 samples in a culture plate or PCR tubes and PCR tray is that it creates variability and increases the standard deviation. If the standard deviation of the samples is too high or the triplicate assay samples are very different from each other, that data point may be un reliable. One way to avoid this partly is to have ( 1) a solid platform to place the samples, ( 2) If the samples have to be kept cold for extended periods of time, keep them in a solid metal tube holder kept on ice. This will help all the samples to have uniform temperature and will work uniformly. 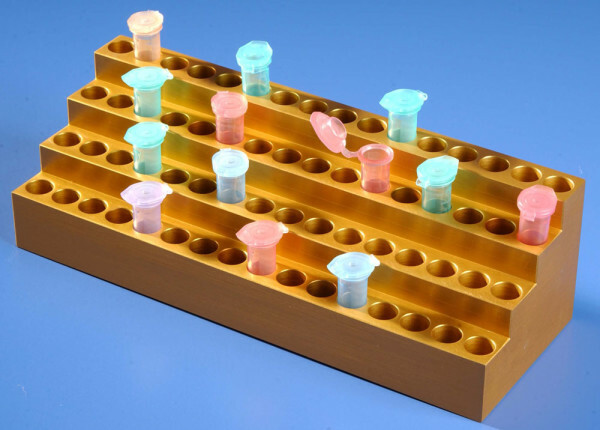 Keep all PCR reagents on PCR Tube Rack (PCR Cool Rack), which is placed on ice after thawing. Keep the reaction mixture in tubes on PCR cool Rack until sample addition. Several years ago when I was working in laboratory, I did PCR very frequently. Each experiment had a lot of sample to process, mostly RNA samples extracted from cells or tissue. In those days we did the PCR using 0.2 ml individual tubes and 0.2 ml PCR tube strips. For setting up master mix for PCR and to keep the PCR reagents such as Taq Polymerase, and samples cold, I kept all the small 0.2 ml tubes on ice in a bucket. Keeping dozens of small clear tubes straight on ice was challenging, especially to add samples and keeping track of these tubes. After few months of this, it became very painful to go through the process and I knew there had to be a better way to do this efficiently. That is when I thought of designing PCR Cool Rack. I went to a local machine shop and asked the owner to make a small tube holder (tube rack) to hold couple of dozen 0.2 ml, and 0.5 ml tubes. I started using them by placing it on ice in an ice bucket. 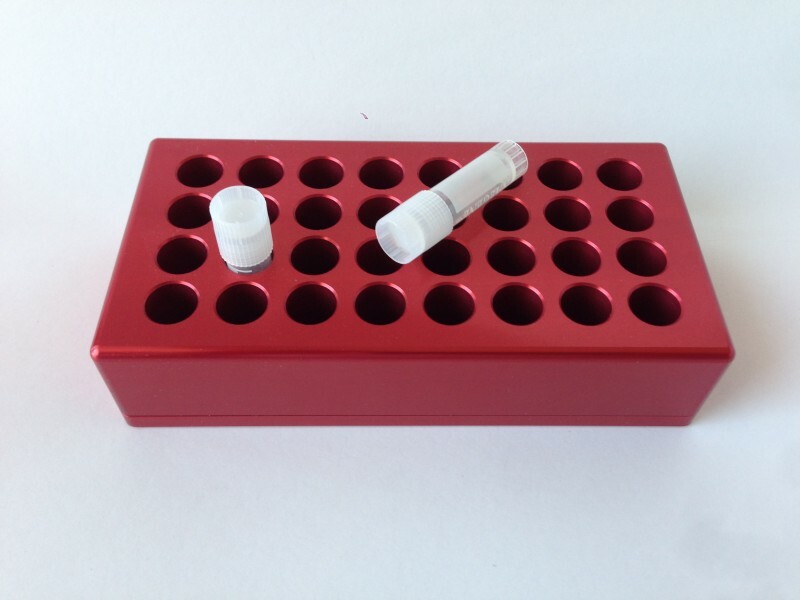 The cool block was made of solid aluminum, and it kept the samples in the tube cold. No only I could keep the samples cold, it also provided a small stable platform to work with. I could prepare temperature sensitive samples in tubes on these cool racks. During this time new PCR format started to emerge in the market. These were 96 well PCR plates, where you can do 96 samples at once. In order to accommodate the 96 well PCR plate I asked the machine shop to make a larger block with wells corresponding to the tubes. Since some of the reagents for the PCR prep came in 0.5 ml tubes and 2 ml tubes, which needed to be kept cold, made the PCR blocks with additional space to hold the tubes as well as a 96 well tray. After precision machining the PCR Block, the aluminum blocks are anodized to protect the surface from corrosion. Afterwards I made these and gave it to my colleagues to use. At this point I realized that if this item is useful for me, PCR Coo Block might benefit other researchers. I made this into a product and in the last ten plus years, it is very widely received in the market. After few years, I designed the Double PCR Cooling Block, which can accommodate two 96 well PCR tray and reaction tubes on the same block. It is very useful to process two plates or transfer samples from one plate to other. PCR cool block (PCR Cool chamber) also provide a stable platform to prepare large number of samples without worrying about keeping them straight, or floating in ice water when the ice melt. 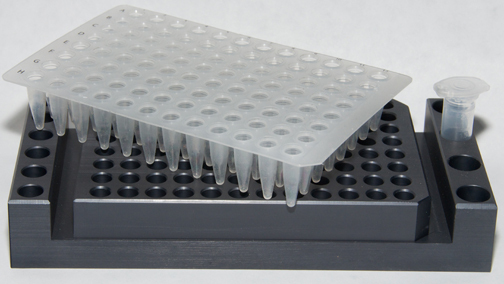 If you prepare 96 well PCR tubes or plates , tube strips, this is a very useful product. One of the significant developments in the life science research has been to take embryonic and adult fibroblasts and reprogram them into pluripotent stem cells. These pluripotent cells can be differentiated into other cell types such as neural cells, cardiomyocytes etc. However a recent development has enabled reprogramming embryonic and adult stem cells directly into specific tissue specific cells without reverting them into pluripotent cell stage. This process saves time and increases safety of the process. Because undifferentiated pluripotent cells can become tumorigenic. Using this direct method one can propagate the desired cell types ex-vivo into large number of functional cells, which can be used for therapeutic applications. One of the reprogramming methods is to deliver the appropriate drug combination to the desired site in the body where the fibroblasts are reprogrammed in situ. The other method is treat the fibroblasts with generic established reprogramming factors and later expose them to specific signals for specific cell types. Different cell types including neuronal progenitor, cardio myocytes, endothelial cells, pancreatic cells, and direct reprogramming has produced hepatocytes. One of the main benefits of reprogramming cells is to expand them ex vivo and deliver to the target area in the body for repair of damaged cells, or tissue. Dr Richard Daley’s lab at Children’s Hospital lab in Boston has been studying the signaling pathway for hematopoiesis and its effect on the differentiation of pluripotent stem cells. Although this is a very promising field to treat blood cell diseases, more research needs to be done for the safety and efficacy of the procedure. One of the issues is the functional variability of the induced pluripotent stem cells. This variability can be partly attributed to genetic and epi-genetic influences. This means developing multiple cell lines in the hopes of finding the ones, which have the functional attributes one is looking for. This is very time consuming and costly endeavor. Increasingly new tools and reagents aid in the research and development in this area. A variety of growth and differentiation factors are offered by a number of companies including reagents as well as plastic wear specifically helping the stem cell research such as multiwell cell culture plates with grids (Grid Plates), and cell culture dish (petridish) with numbered grids (Grid Dish) . Companies, which offer a number of stem cell related research reagents include Life technologies, Stem cell technologies, Cellular Dynamics etc. DNA sequencing technology is at the core of the modern personalized medicine. DNA from various cancer cells of the patients can be sequenced very rapidly, efficiently and cost effectively. This in turn improves diagnosis and prognosis accuracy with a better outcome for the patient. By sequencing DNA of disease cells from the patients, one can identify specific defects in the genome sequence identify potential targets, and recommend an effective treatment modality reducing the un wanted side effects and reducing mortality. The traditional Sanger method was widely used successfully for years with good results. An improved method was employed and was instrumental in successfully completing the human genome project. During the last few years as the advancement in bioinformatics, PCR Thermal Cyclers, microfluidics, and micro fabrication, steady progress has been made in the DNA sequencing technology. The new methods has also increased throughput driving down the cost. With the advent of new technologies, massive amount of DNA templates can be sequenced in parallel, some times on the same instrument at once (generally known as next generation sequencing). This is a major advancement for cancer diagnostics, and effective therapy. The next generation sequencing technology, which are now on the third or fourth generation making the sequencing faster and affordable than ever before. This advancement is enabling global collaborations and partnerships such as Cancer Genome Atlas to identify and interpret sequence data from thousands of cancers. In the health care filed next generation sequencing technologies enables genetic screening for rare diseases and early detection. It can identify clinically relevant point mutations, access tumor progression, and can guide in recommending targeted therapies to match each person’s characteristics. This targeted approach is more effective produces less side effects and better prognosis. Along with the advancement with the hardware for the next generation sequencing, data analysis software and bioinformatics is also advancing. Original bioinformatics data based on standard reference sequences had to be modified to accommodate the much more complex sequences from thousands of cancer cells which show high level of heterogeneity. In this case a close collaboration between a doctors from the clinics and the bioinformatics professionals have to work together to identify the patterns associated with specific cancer or other genetic diseases. Latest developments in technology and bioinformatics are writing a new and promising chapter in the human health care and personalized medicine. High content analysis (HCA) is a versatile tool used in basic research, primary screen for drug discovery efforts where the effect of certain drug compounds are tested on the cells, or target identification, and predicting clinical outcomes. High content analysis is being utilized increasingly in the research and drug discovery screen everyday. Availability of newest technology, wide array of reagents including labeling reagents makes high content analysis very efficient and powerful tool. High content analysis combines three separate tools (1) fluorescent microscopy, which allows the use of wide array of fluorescent labels to label cells and gives flexibility not only to image the cells but also measure cellular changes at different resolution. Away from the limelight, press coverage and noise, a small California company has been hard at work in transforming the health care industry. Decades old established procedures and practices dominated by large national laboratories which are still in use today, are being challenged and this company is writing a new paradigm for the future of health care. The company is Theranos, based in Palo Alto CA, and is featured in the front cover of Fortune Magazine, June 2014 issue. Cell culture involves isolation of cells from an animal, or plant and culturing in a dish in a favorable growth conditions for the cells. Cells can be isolated from a tissue including human normal or tumor origin by enzymatic digestion or mechanical means to obtain single or multicellular population for subsequent culture. Cell culture can also mean culturing cells derived from a cell line, which was previously established. Multiwell plates are a plastic tray with a cluster of wells typically, 24, 48, 96, 384 wells. Each well in the cluster are arranged in a rows and columns. Each well is used to add a number of items such as cells, chemicals, or other reagents. These multiwell plates are very commonly used to culture cells, do chemical reactions such as ELISA or PCR and they are known as cell culture plates, ELISA plates, or PCR plates according to their use. Individualized medicine is one area there is new developments are happening. During the last several years during drug discovery, drug candidates were screened or assays on generic cell lines for the ability to kill these cells, cell binding and any other phenotypic changes. Although the information obtained from these assays were relevant as a whole, it will not have any specific effects to the particular patient being treated. Multiple patients with the same type of cancer, one drug might effect differently for different patients. Using cells to test new drug compounds for phenotypic changes has been used for years. However in recent years cell based assays are getting more attention and importance from the industry. In 2012 the market for cell-based assays exceeded 2 billion dollars. However by 2022 it is predicted to quadruple to 8 billion dollars. This growth is fueled in part by increasing dependence of pharma and biotech-using cell based assay as an important screening tool. And also because of the new technology for understanding cells in vitro using a variety of tools. Testing a pharmacological compound in different cell based functional assays reveals its mechanism of action clearly. Thermal cyclers also known as PCR machines are very commonly used in almost all modern molecular biology and cell biology labs. Thermal cyclers change the temperature of the sample at precise intervals and duration to amplify the small genetic material by PCR. The rapid regulation of temperature has to be very precise and consistent to get good amplification. Thermal cyclers are also used in diagnostic labs and in forensic laboratories to solve crime by identifying and matching the genetic material obtained from the crime scene to the suspect. Laboratories at pharmaceutical and biotech companies, as well as academic institutions utilize various types of equipment daily to do experiments, grow cells or bacteria, etc., Many of this equipment are used for specific processes such as heating, mixing, and measuring. If such processes are not handled and completed with care, it can lead to dangerous situations. The wrong combination of chemicals can lead to small explosions. The improper handling of a burner can result in a fire. Glass products can crack and break, causing physical harm to the scientist. Scientific establishments such as laboratories, research centers, and companies require high quality lab equipment to perform a variety of tests and experiments. The success of these activities depends a great deal on the strength, quality, and durability of the lab equipment. They not only help to provide accurate results but they also enhance the efficiency of the work done at the establishment. 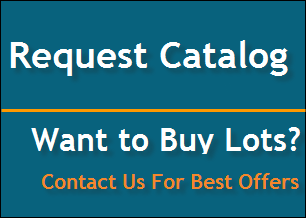 It suffices to say that the process of purchasing laboratory equipment must be completed keeping a lot of important factors in mind. It is better to freeze cells when they are in the growth phase or when cells are growing rapidly. You can plate the adherent cells in a petridish or in T 75 tissue culture flask and add fresh medium the day before you freeze the cells. Cells should be close to confluent, covering most of the surface. At this stage they are growing rapidly and with fresh supply of medium, they are happy and healthy. If you are freezing suspension cells make sure they are also in the growth phase before you freeze them. When you work in a cell culture laboratory, protein chemistry laboratory, or molecular biology lab often you are required to do large assays. I have worked in few companies in the lab and I know what it is like to deal with dozens of sample tubes. Very confusing and often difficult to keep track of , which leads to costly mistakes. Hours of time spent on preparing samples, collecting samples all that can go to waste if you make a mistake mis identifying the sample, or adding the wrong reagents. It is very frustrating, specially painful when your manager is waiting for the data to present at a management meeting. Sound familiar?. You are not alone. Isolation and expansion of primary cells using magnetic particles and magnetic system are very commonly employed in the research labs. It is a very established technique and has been in use for several years. This method is based on the separations of various cell populations of interest based on their cell surface antigens (CD molecules). Magnetic based cell isolation is used in areas such as cancer research, immunology, neuroscience and stem cell research. If the cells are isolated from a primary tissue, first the tissue has to be digested or manually processed to make it a single cell suspension as much as possible. Some of the digestion process involves incubation the tissue with certain enzymes. Thermal cycler is a technologically advanced laboratory apparatus that is useful for various experiments. This device is also known as a PCR machine or DNA amplifier because it helps in amplifying the segments of DNA via the polymerase chain reaction. Based on the intricacy of the scientific experiment, you can opt for the most suitable thermocycler from a wide range. Be it a simple one-channel instrument or an advanced multiplex system that has up to six channels, thermal cyclers are available in all the configurations. Multiwell plates of all sorts, 96, 48, 24, 12, and 6 well and Cell Culture Dish are very commonly used in life science research. 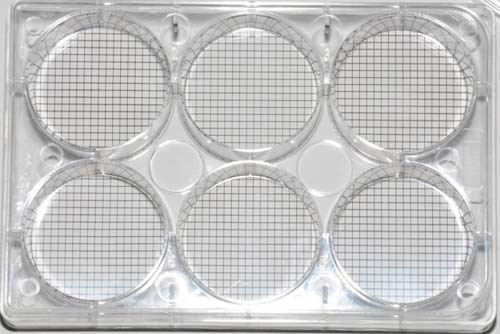 Multiwell plates are used in cell culture experiments, growing colony of cells, or tissue samples. They are also used for other assays such as immune assays (ELISA), and fluorescent assays. In any of these applications user will be manipulating several plates at a time. Some times these Multiwell plates are stored at cool temperature, or sometimes in the 37degree incubator. It is very common in the laboratories scientists and researchers work with literally dozens of samples tubes for various experiments. These sample tubes usually contain very valuable, some even irreplaceable contents. To do the experiments properly, each tube has to be labeled with the correct content of the tube. Mis-identification will lead to wrong experimental conclusions, and hours and hours of wasted time and resources. Isolation of Cells and Nucleic Acid (DNA, RNA) Using Magnetic Stands and Columns. Magnetic bead based separation of cells, extraction of DNA and RNA are very commonly employed in the laboratories. This method is suitable for automation and processing by automated liquid handling robots offered by a number of vendors. It is relatively fast, easy and cost effective. Magnetic particle based cell separation can be used to isolate specific cell population from a heterogeneous mixture of cells based on their specific cell surface antigen (CD Molecules). Multiwell Plate Storage Rack – Storage of Multiwell Plates for Easy Access. Multiwell plates are very commonly used in the lab. They range from 6, 12, 24, 48, 96, 384, 1536 etc. They are used for cell culture, molecular biology experiments, and protein chemistry experiments. The multiwell plates used for cell culture have a special hydrophilic coating, this allows for easy attachment of the cells to the plastic surface. Almost all the multi well plates are designed with the same footprint, commonly known as SBS foot print or dimensions. The reason for this standardization is because all different types of plates, irrespective of the manufacturer will fit all the instruments, and other hardware used in the laboratories. Circulating tumor cells (CTCs) are epithelial cells with nucleus circulating in the blood of cancer patients. Levels of abundance of these marker cells in the circulating blood of cancer patients undergoing treatment may indicate the severity and progression of the cancer and overall survival. These cells are extremely rare in numbers in the blood and identifying them and harvesting them has been a challenge. Many mammalian cell types are anchorage dependent. They need to attach to a solid substratum for them to start to grow. If these cells are forced to grow on a substratum such as a viscous fluid or gel (Example: agar or agarose) where they cannot attach, they fail to grow. However if these cells are treated with certain chemicals and are transformed, they are able to grow in a viscous fluid or gel and become anchorage –independent. There is nothing scary and disheartening than coming in Monday morning after a nice relaxing weekend, open your laboratory cell culture incubator and check your cells in your culture flasks to see them all contaminated. There goes the week’s worth of experiments, time wasted in expanding the cells from the limited number, cost of wasted reagents. I have done mammalian cell culture for more than 12 years and during this time I have picked up some wisdom regarding sterile techniques which may be useful. I have worked in the industry for more than 20 years at various companies, academic institutions etc. Mostly I worked in a life science laboratories. I can’t remember at any of these labs had any spark of color. Mostly they were industrial, dull, un exciting, boring, and un inspiring spaces which housed an array of dull looking instruments. Most of the colors of the instruments and other components were grey, black, white, or some variations or combinations of the same. In recent years a confluence of factors in the life science industry research and development has contributed to the increase in productivity in the drug discovery we see today. This includes development of exciting new technologies, a better understanding of human genome for target selection, development of ultra fast computational and IT infrastructure, vast array of sophisticated instrumentation for every conceivable application, and equally vast supply of reagents to support various R&D efforts. Drug discovery has undergone transformational changes in recent years. In the past purified cell membrane preparations were commonly used in receptor binding assays to identify compounds which bind to specific target receptors. This provided a homogeneous assay with end point readout which was easy to adopt in high throughput screen (HTS). As physiological importance of using the whole cell rather than the membrane fraction was realized, whole cell assays were adopted in drug discovery. 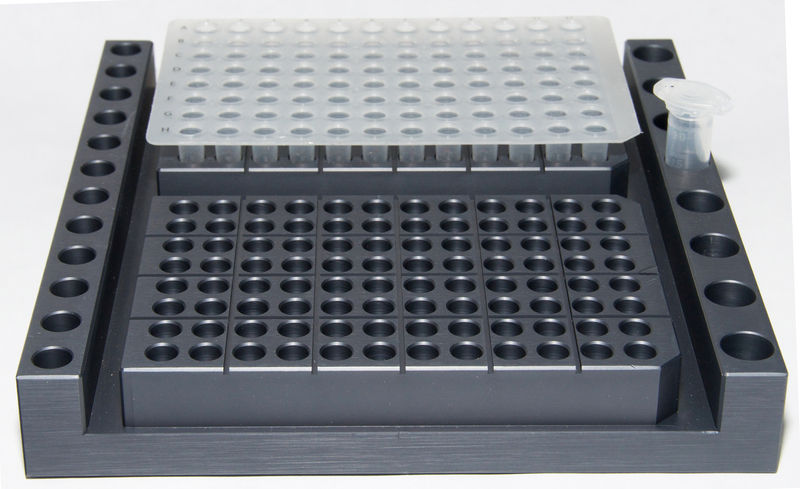 Multiwell plates are one of the most commonly used tools in life science basic research as well as drug discovery area. It is as common in academic research labs as they are in biotech and pharmaceutical industry. Over the last decades, since its introduction, it has evolved into different formats, functionalities, and density of wells in the plates. Some of the next generation multiwell plates do not even look like standard multiwell plates. In the last article we discussed the increasing use of HCS in drug discovery and its important applications in drug discovery. Here we will discuss the leading providers of hardware, software and consumable kits used in the high content screen. One of the leading companies in this area for instrumentation and ready to use assay kits is Cellomics, currently part of Thermofisher Scientific. Cellomics has automated the HCS for cell based assay platform by offering complete system. During the last few years pharmaceutical and biotech companies have adopted high content screening (HCS) extensively in their drug discovery research. High content analysis uses automated microscopy, to capture cellular images, and analyze them using software to quantitate complex cellular events. This includes cellular morphology, biochemistry, and differentiation, translocation of proteins, proliferation, and apoptosis. The specialized software recognizes patterns from the images and quantify the differences between wells as accurately as possible without bias. During the past decade a large number of potential drug candidates successfully selected at the early stages of screening, have failed to make it to the market due to various issues including pharmacology. This alarming rate of failure has led the biotech and pharmaceutical industry to re -evaluate their drug discovery models. While last few years have seen a general shift towards employing cell based assays, emergence of the use of stem cells as part of the screen has the potential for new opportunities for a new paradigm in drug discovery research. Several years ago, while I was working at life science laboratory I had to routinely prepare samples of RNA, DNA, Protein, etc. Many of these samples were temperature sensitive, and get ruined if kept at room temperature. I had very difficult time dealing with tiny 0.2 ml clear PCR tubes containing RNA and PCR mix kept on ice in an icebucket. It was very difficult to add or retrieve samples from the tiny tubes placed on ice. Most of the time it was difficult to keep the tubes straight. How to reduce stress and fatigue from repetitive pipetting. 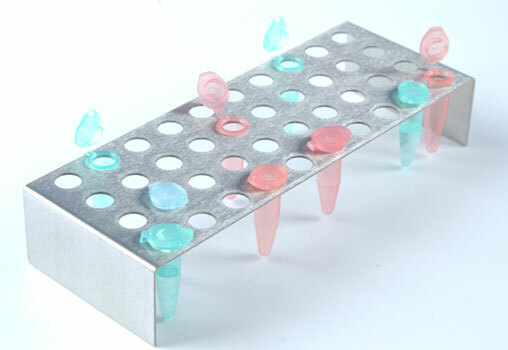 Pipetting is a highly repetitive laboratory task done routinely in most of the labs. Extended periods of pipetting, especially manual pipetting, can cause a number of fatigue related disorders including joint pain at the wrist, shoulder pain, tendinitis, and excessive stress on the back from awkward postures. Some of the (preventable) factors of these conditions are: twisting or bending of the wrists for extended periods of time, excessive force exerted on the thumb to press down the pipet plunger, and standing for extended periods of time in the same position.